Adobe After Effects is not a traditional video editing software, it is mainly a software that is used to add effects to a video that has been processed. However, it can also be used to combine clips using a certain method which is described in the steps mentioned below. If you want to know how to merge layers in After Effects, continue reading! After Effects as a professional video editor is powerful, but it is so difficult to use. However, if you want to have a much easier editing experience, consider Wondershare FilmoraPro to combine videos, which can combine clips in three very simple steps as mentioned below, making the task much more time saving and easy without compromising the quality of the results. You can also make various effects just from dragging and dropping. Download it now to have a try (Free)! Start the program and import the video files that you want to combine. Drag and drop the video files to the timeline and simply add transitions if required, or you can just drag videos onto timeline if you don't want to use transitions. Click export > in-out area, choose various formats you like. Then click start exporting. Merging layers in After Effects is so easy to understand if you follow the steps below. Start the program and open the files in the project panel that you wish to combine. Drag and drop each file from the project panel to the timeline panel provided at the bottom. Right click on the video file at the bottom left corner. 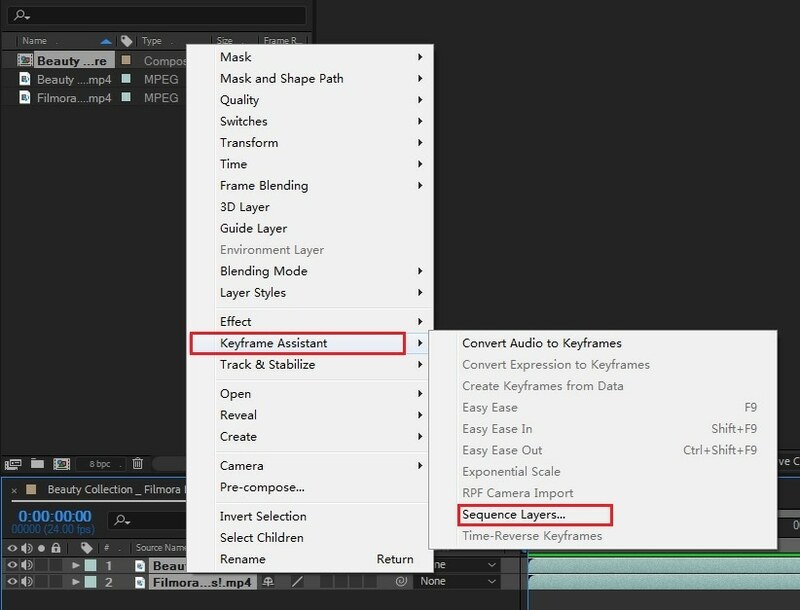 Select Keyframe Assistant > Sequence Layers. Then a pop-up window will appear. Click OK.
Then you will find the two video clips are seamlessly mergered together. Now save changes and export. This open source program is an efficient video effect software alternative to After Effects which provides many exciting features such as compositing, 3D text effects, adding motion effects etc. This is an open source program that runs freely on all operating systems including MaC, Windows and Linux. It provides users the opportunity to perform 3D modeling as well as video effects effectively. The interface and concepts of this open source program were mainly derived from a previous software called “Nuke”. It is also a video effects and composite software which provides many new features and efficient tools for high speed and maximum quality composite results. Maya is a helpful software that allows the users to create 3D models, animations and helps compositors get the job done quickly. It has a very interactive user interface as well. As the catchy name of the software suggests it provides thrilling options and features to its users along with plenty of aesthetics in the user interface. It is even referred to the “highest speed compositor of the present market”. It provides certain features such as, 3D modeling, adding effects, stereo sounds etc. Now you must know how to combine videos in Effects. If you still don't know, we suggest you use FilmoraPro that is designed for pros and semi-pros who want to edit videos easily. Just download now to start combining videos easily (free)!